I’m a huge fan of lace! However trying to find modest lace tops is always struggle since majority of the time it’s see through – no bueno! When Modest Lily reached out to be for a collaboration I instantly said yes because of the detail and thoughtfulness behind the brand. Tasnuva pays close attention to fabric, the movement of the top, the functionality of the clothes when designing her products. Above all she designs clothes that make it easy for modest gals like me to be able to wear one piece and not have to layer – for modest reason – in order to be fashionable! This beautiful lace top is lined with the softest stretch fabric that makes it a versatile piece that can be worn during all four seasons. I styled it for a casual fall day with leggings, knee high boots, and moto vest for layering. 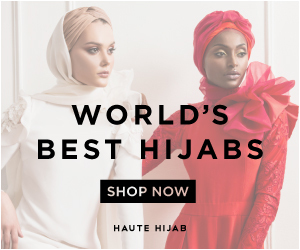 Be sure to head over to Modest Lily and check out their beautiful designs! I have my eye on this beautiful blue dress.